God took another angel home. On January 21, 2019 Betty Alice Alberta Dunn went home. She was born on January 24th, 1936, in Scottsville, Kentucky, the daughter of William and Myrtle Hagan. 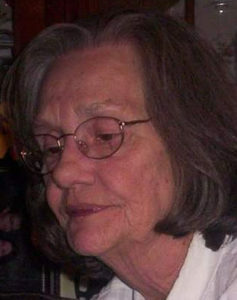 In addition to her parents she was predeceased by her husband James Dunn, granddaughter September-Rainn, and grandson Dayton and brother-in-law Jim Britt. Lovingly remembered by: Daughter Carol Mitchell Coleman of Spirit Lake, Iowa, Sons Hugh Dunn and his wife Lexann of Vincennes, Indiana, and Robert Dunn and his wife Lorraine of Poland, Indiana. Ten grandchildren: Chere Bohr of Wyoming, Joey Gude of Iowa, Johnny Murdock of Indiana, Desiree Murdock of Pennsylvania, Lindie-Starr Dunn, Ashley Somerville, Lauren Dunn, Andrew Dunn, Brittany Young and Chasity Henderson of Indiana. Along with thirty one great grandchildren and one great great grandchild. Sisters, Sandra Britt of Indianapolis, Indiana, and Jerree Fisher and husband Dale of Plano Illinois, Aunts, cousins many nieces, nephews. Betty loved her family, nature, animals, sitting on the porch in the rain, and thunderstorms. Betty was loved by many and will be greatly missed. Betty retired from Wishard Memorial Hospital in Indianapolis, Indiana, where she worked 30 plus years as Chief of Communications. A celebration of her life to be scheduled late Spring/early Summer.